This is the Second Edition of the highly successful introduction to the use of generating functions and series in combinatorial mathematics. This new edition includes several new areas of application, including the cycle index of the symmetric group, permutations and square roots, counting polyominoes, and exact covering sequences. An appendix on using the computer algebra programs MAPLE(r) and Mathematica(r) to generate functions is also included. 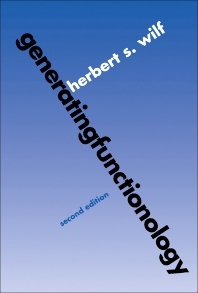 The book provides a clear, unified introduction to the basic enumerative applications of generating functions, and includes exercises and solutions, many new, at the end of each chapter. Introductory Ideas and Examples. Series. Cards, Decks, and Hands: The Exponential Formula. Applications of Generating Functions. Analytic and Asymptotic Methods. Appendix: Using MAPLE(r) and Mathematica. (r) Solutions. References. Index.